This happens a lot. I shoot a scene paying attention to the main subject, composition, and focus. That’s what you need to do. I get back to the office and now I find a different photograph. Hidden animals and scenery. It can ruin a shot, or make it fun. Photographs like this remind me why it is so easy to walk right by the locals out here. The egret got out alive, right? Oh yeah, this happens every day. They do get caught, just not as often as you would think. 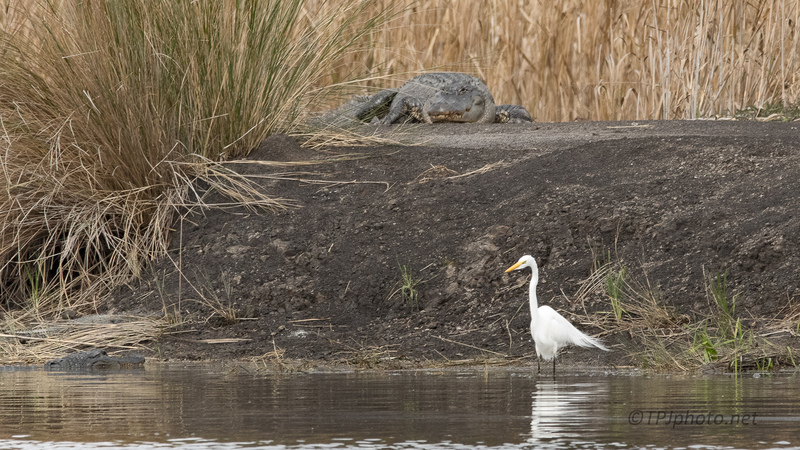 I make it four – 3 alligators and the egret. Very interesting photo! Good point 😀. This happens all the time. I have seen them walk on them when they are all out in the sun.